Carolyn Forché is 27 when the mysterious stranger appears on her doorstep. The relative of a friend, he is a charming polymath with a mind as seemingly disordered as it is brilliant. She's heard rumors from her friend about who he might be: a lone wolf, a communist, a CIA operative, a sharpshooter, a revolutionary, a small coffee farmer, but according to her, no one seemed to know for certain. He has driven from El Salvador to invite Forché to visit and learn about his country. Captivated for reasons she doesn't fully understand, she accepts and becomes enmeshed in something beyond her comprehension. I cannot recall reading another novel with so much narrative tension and dramatic contrast: the deepest of love and admiration for fellow human beings, set in the midst of unspeakable horrors in Central America. 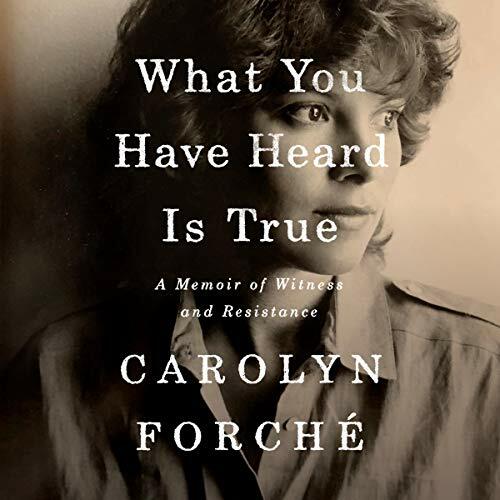 Carolyn discovers and speaks about these horrors because they are key to understanding how our choices at home directly affect fellow sapiens in "far-off lands." It's a cinematic non-fiction cautionary tale, carefully worded to lay bare the emotional truth of how we are connected, in a way that only a poet could deliver. The audiobook version is great because Forché performs the poem in her own voice. Ultimately, the story reminds us that we are all not as insulated from each other as we often think we are. Understanding this now seems more important than ever. A book that bridges the history of El Salvador and the United States from the past into the current moment. This is what it sounds like to give witness to the truth without looking away, without denial, without flinching.